Founder of War Child USA and Canada, Assistant Professor at the University of Toronto, public speaker, activist and bestselling author. For readers of Christopher Hedges, Robert Fisk, and Christopher Hitchens, an extraordinary humanitarian gives us a bracing and uncompromising account of her work in some of the most devastated corners of the world. In 1995, twenty-five-year-old Samantha Nutt, a recent medical school graduate and a field volunteer for UNICEF, touched down in Baidoa, Somalia, “the City of Death.” What she saw there – gangs of young men roaming the streets armed with rocket launchers; a woman in a clinic line holding a dead baby; an aid agency working in such an unsafe environment that its workers had to travel with armed escorts high on drugs -would spur her on to a lifetime of passionate advocacy for children and families in war-torn areas around the world. 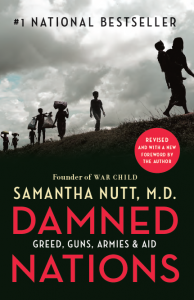 Damned Nations is the brilliant distillation of Dr. Nutt’s observations over the course of fifteen years providing hands-on care in some of the world’s most violent flashpoints, all the while building the world class non-profit War Child North America. Combining original research with her personal story, it is a deeply thoughtful meditation on war as it is being waged around the world against millions of civilians — primarily women and children. Nutt’s boundless energy, dedication, and compassion shine through on every page as she lays out real, lasting solutions to these problems and shows how to move beyond outdated notions of charity towards a more progressive, inclusive, and respectful world view.